On Wednesday, July 22nd at 7 p.m., NH Fish & Game Wildlife Biologist Kristine Rines presents a program on the New Hampshire moose population. 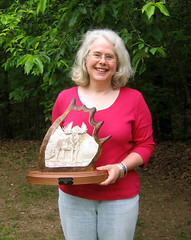 Kristine, the Moose Project Leader for the New Hampshire Fish and Game Department, was awarded the prestigious title of Distinguished Moose Biologist of the Year at the 42nd annual North American Moose Conference and Workshop held recently in Baddeck, Nova Scotia. Rines (formerly Bontaites) is a resident of Tamworth. She is a graduate of Michigan State University and a New Hampshire native.